ARTIST: Elvis Presley TITLE: TV Special YEAR: 1968 LABEL: RCA COUNTRY: Greece NUMBER: SKLG 20031 CONDITION: Vinyl and cover are both in very good condition. Record has many hairlines and a scratch which is not feelable with lightly finger brushing and is not affecting playback. Cover has some bends on the top, as pictured, and some age-wear on the back cover (there is also a sticker on the bottom, from an old record store). NOTES: TOP RARE Unique Greek original 1st press Lp, which is never shows up in ANY condition!!! Front-only laminated sleeve, with advertisments of the Greek RCA records back-catalogue on the back cover (picture 2)!! 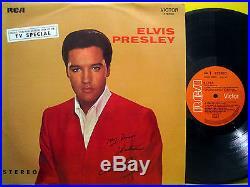 One of the rarest Elvis' LPs worldwide and by far the rarest Greek Elvis' Lp! REST OF THE WORLD and USA. Since vinyl grading seems to vary greatly between dealers, here is an overview of our grading system. Version of the Goldmine grading system. Sealed: When the item is still wrapped and unopened since the time it was originally manufactured. Mint: When the item is brand new and untouched. The flaws may be insignificant to most people, but a truly MINT item is absolutely perfect. We NEVER grade an item "MINT", if we are not 100% sure that it is unplayed! Near Mint (NM): Normally, our highest grade. The vinyl may have never seen a turntable. Covers are bright and crisp. NO splits or bends at all. Near Mint Minus (NM-): An item that has VERY LITTLE (if any) use. The item looks NEARLY new. The vinyl may have light paper scuffing (light surface discoloration visible under the light caused by either contact with the paper inner sleeve or sometimes a minor pressing flaw; SCUFFS DON'T AFFECT ITS PLAY). Covers may have a minor flaw such as a small wear spot or mark, but look definately NM. Ususally these small imperfections won't bother anyone, but the most discerning collector. Excellent Plus (EX+): An item with a more noticible flaw, such as a scuff line on vinyl (a light surface mark that can be seen, but NEVER heard) or minor ring wear on the cover. These flaws are minor and perfectly acceptable to most collectors. Excellent (EX): Items that have been played, but carefuly. The vinyl may have paper scuffs or some light hairlines that cannot be felt by lightly finger brushing. The vinyl still plays fine, usually with no noise. Covers may have light ringwear or edge wear. They may have minor writing or creasing. Still, flaws should not stop the collector from enjoying the item. Very Good Plus (VG+): Items show wear. The records may have light scratches. They should play through with NO skips or repeats, but MAY have some ticking or backround noise. Covers may have ringwear, or light staining, or writing, etc. But will still be intact. VG+ records are good keeper copies for collectors to fill a gap, or good copies for less discerning record buyers. Very Good (VG): The only items we list in this condition are RARE titles that someone may want to own, regardless their condition. However, VG records are NOT trash copies and play ok, with some background noise. Covers may have heavy ringwear, or seam-splits, damages , etc. Good (G): We never list in this condition unless few exceptions, like mega rare record s that achieve sky-high prices when they are in EX+ condition or better. These copies are just filler copies in a record collection! All flaws worth noting to potential buyers scratches, MINOR warps, cut out holes, saw marks, split cover seams, writing, etc. Will be listed in the. Unless otherwise stated, our products are VISUALLY graded. With thousands of items available we just don't have the time or staff to play grade everything. We grade VERY conservatively, which makes happy customers all around the world! 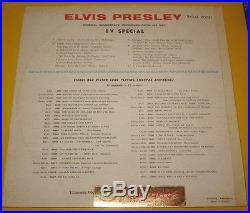 The item "ELVIS PRESLEY TV Special TOP RARE UNIQUE 1968 GREEK-ONLY ORIGINAL 1st PRESS LP" is in sale since Monday, November 21, 2016. This item is in the category "Music\Records".noll" and is located in Athens. This item can be shipped worldwide.